Maintaining a home is costly as it is without the unnecessary headaches that come with repair, especially when it’s the very concrete that holds your home together. Over time, exposure to harsh chemicals and elements such as the sun and water, combined with the daily wear and tear can deteriorate the quality of concrete. The location of your home can also put concrete at added risk in the form of natural disasters, bad weather, and floods. It can also cause mold and mildew to form, posing a serious hazard for homeowners. Water is the worst of it all because it carries salts and chlorides that can harm all kinds of surfaces, causing it to continuously crack as time goes by. Homeowners who are looking to protect concrete surfaces such as driveways, patios, and sidewalks need to use a top quality professional sealer that ensures your concrete will last several decades. There are many kinds of concrete sealers on the market that promise to do the job, but acrylic and elastomeric products only provide a temporary solution. To truly stand the test of time, it is recommended to use a high-quality sealer that can efficiently adhere to all kinds of concrete surfaces while blending with the concrete’s natural color, so that you don’t have to worry about the aesthetic aspects once the job has been done. A gallon bottle of an effective sealant is enough to cover large projects, while leaving you with just enough for touching up in the future. For smaller projects, a quart will do. There are many kinds of concrete sealers on the market. However, nothing compares to Quikrete Concrete Crack Seal Natural. The people behind Quikrete have years of experience working with all kinds of concrete cracks, and have taken pride in developing a one-size-fits-all solution that is effective and durable. 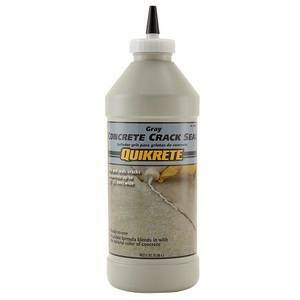 The Quikrete Concrete Crack Seal Natural can be used on any concrete surface including driveways, patios, steps, decks, appliance platforms, and sidewalks. It’s one of the top-rated concrete sealers on the market; known for its quality and affordability. Homeowners also love that it’s so easy to use; there is no mixing required. To use this concrete sealer, all that’s needed is to pour the sealer directly from the bottle, and it automatically blends with the natural color of your concrete. If you are a homeowner that is looking for a preventive measure or a solution to existing concrete cracks, look no further than this product. One of the best features of the Quikrete Concrete Crack Seal Natural is its ease of use. There is no need to mix anything into the sealant; simply shake well and then use. Keep in mind that the crack should be cleaned of oil, grease, gravel, dust, and loose dirt prior to application. The tip of the spout can be cut to adjust to the size of the crack, whether it’s a 6mm or 9mm hole. After 24 hours, a second coat can also be applied for uniformity. Consumers from all over the country love this sealant because Quikrete is a trusted name in quality products. They have long been committed to manufacturing only top quality and safe sealants, whose efficacy and durability has been tried and tested by thousands of customers. Customers are very satisfied with Quikrete Concrete Crack Seal Natural. Even though it’s made for concrete surfaces, there are some who have experienced great success using it on brick walkways even if the crack is fairly deep. It’s a great product that is worth the investment, since not only will it protect concrete surfaces from the elements, but ensures that your home is well maintained for decades to come. The product is simple and straightforward; there’s nothing fussy about it. Customers have also found that for best results, this product is best used with a putty knife. Homeowners who are looking for powerful concrete sealants need to look no further than Quikrete Concrete Crack Seal Natural, which is known for delivering long-lasting results. Surfaces finish great and there is no need to worry about the cosmetic aspect of the job, because it blends well and adheres to the color of your concrete. You can sleep well at night knowing this product has saved you money in costly renovation and repair costs. This product is among the best in the market when it comes to performance, durability, and affordability. It’s no surprise that it has received dozens of positive reviews from satisfied customers on Amazon. If you need to find an ideal sealant, trust Quikrete Concrete Crack Seal Natural to do the job. Too many homeowners underestimate the importance of sealing cracks in their home. Likewise, too many don’t know how easy and inexpensive it can be to fix it yourself without shelling out hundreds of dollars. Homeowners are extremely pleased with how well Quikrete Concrete Crack Seal Natural performs, and most especially how easy and straightforward it is to use. A simple pour can do wonders for the look and durability of cracks in your driveway, pavement, patio, and even bricks!